Got so far last night, when I realized I have no soldering tools. What that means is no way of getting the senors on, not without some creativity anyway. Currently turns left and moves forward a bit( just random test), but I’ll get to coding the Arduino after the senors are up and running. More pictures to come after it’s ready to take over the multiverse. At that point I’ll add some ‘making of’ pictures as well. I’ll have no commenting about the ugly foam. It’s the only thing I found at the moment. 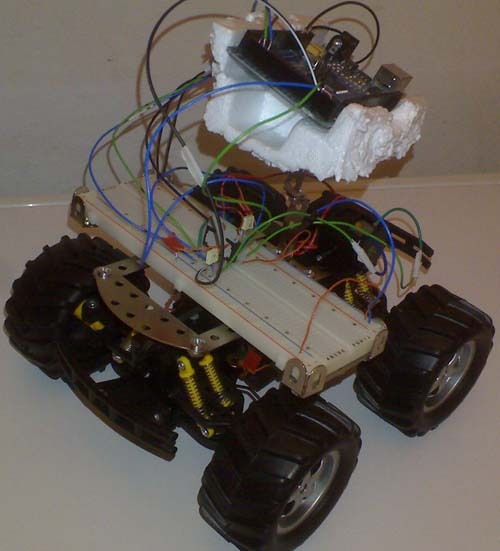 This entry was posted in Article and tagged arduino, hardware, L298, mechanism, microcontroller by Andrew. Bookmark the permalink.